Sit down, relax, and enjoy one of our Trail Benches. 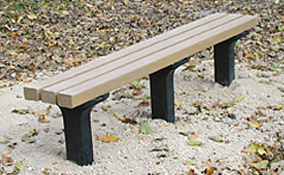 These 100% recycled-plastic benches serve as an excellent rest stop along jogging, walking, and bicycle trails. Their solid construction is made to withstand hard use from both man and nature. Because they are unaffected by moisture, they will not rot or splinter, thus providing a long-lasting, cost-effective alternative to wood or concrete. But don’t let their name fool you, just because we call them a trail bench doesn’t mean they can only be used on trails. They can be used for numerous outdoor applications, whether as one bench outside your back door, or multiple benches for outdoor seating, such as an amphitheater. These economical recycled-plastic benches will help you stretch your dollars. Trail park benches have black legs but colored legs are optional by special order. Seat colors are Cedar (butterscotch), Green (forest green) Gray (cement), Brown (milk chocolate). 11.25″ x 48″ or 72″ seat. 17.5″ seat height.